“We have the answers. We really do know what to do!” -Adrian, 16. I arrived at New Milford High School on a day that felt like any ordinary Friday. But neither I or the twenty 9th, 10th, and 11th graders I spent the afternoon with knew that their perspective about school was about to change. We started our afternoon with a roundtable. Shy to participate at first, students began to open up slowly, They talked about guidance counselors and the bullying they see special needs students experience each day. They also discussed the poor quality of their sexual education curriculum, and lack of communication between the administration and the students. After an hour of discussion, students returned to the table with a different attitude. This was the first time they had been given the time and space to discuss what was happening around them. It took an in school field trip, a facilitator visiting, a supportive advisor, and time dedicated specifically to discussion, but these students found not only their voices, but felt empowered to do something about it. In small groups, they got to work brainstorming solutions to the issues they identified. By the time the afternoon came to a close, the students were facilitating the conversation all on their own. They shared ideas with each other. They asked questions and pushed one another to think further outside of the box. The students of New Milford High School are a testament to the fact that students can be more than just passive consumers of education. When given guidance and resources, students have the capability to be active partners in policy decision. 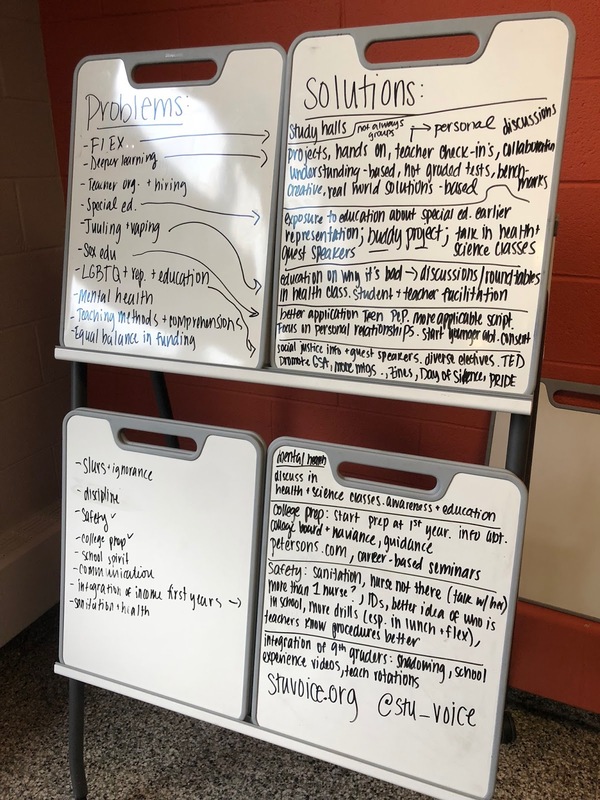 Students will be starting a Student Voice Chapter at New Milford High School to continue these conversations, tackle more issues, and create new policy proposals to ensure that students have a voice on the decisions and issues that impact them the most.